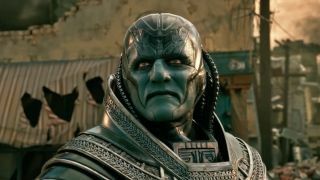 Early reactions to X-Men: Apocalypse's villain were.... mixed, to say the least. Devoted fans of the first mutant, El Sabah Nur, were a little upset at how he was depicted in that first batch of images. His skin was tinted purple and he generally didn't mesh with the comic book version. And it turns out they weren't alone, as Oscar Isaac reveals he wasn't overjoyed by the screenshot chosen for his grand introduction. "I was not super pleased with those first photos that ran," he tells EW, "When you look at those things, you think that’s the representation of the character, and it was a shot from when we were coming out of a portal, and the portal light is purple and so suddenly everyone thinks that the character is purple which is not the case." Singer avoided even more outcry in the way he chose to create the bad guy. While there's been a fair chunk of criticism surrounding Isaac's role, and how he was underused beneath all the makeup, it could have been worse. Singer's original plans involved an entirely CG-crafted look for Apocalypse. Directed by Bryan Singer and starring James McAvoy, Michael Fassbender, Oscar Isaac, Jennifer Lawrence, Olivia Munn, Tye Sheridan, Alexandra Shipp, Sophie Turner, Rose Byrne, Nicholas Hoult, and Hugh Jackman, X-Men: Apocalypse is out in UK cinemas now and opens in US theatres on May 27, 2016.